WASHINGTON — Bush has become a four-letter word in this contest. In Colorado, where the GOP will select its gubernatorial nominee Tuesday, a Bush cousin is finding that his ties to the family that once defined Republican politics have tripped him up in a party increasingly defined by a new family — the Trump family. The frontrunner, state Treasurer Walker Stapleton, shares more than a name with George Herbert Walker and George Walker Bush, who headlined a fundraiser for the candidate in February. Stapleton is a cousin of both former presidents, got married at the family’s compound in Kennebunkport, Maine, and his campaign and super PAC have accepted close to $30,000 from a dozen different Bushes, including Jeb and his wife, Columba. Former state legislator Victor Mitchell, who polls place in second behind Stapleton, has hammered the Bush connection on the campaign trail and in TV, radio and digital ads. 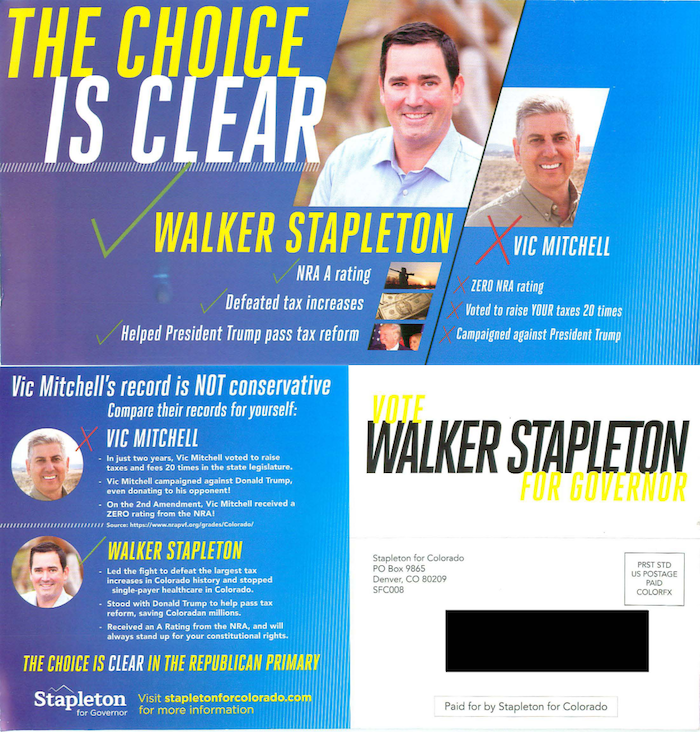 “Walker Stapleton claims he’s a Trump guy. But Stapleton’s a Bush cousin, taking big bucks from the Trump-hating Bush family network,” says the narrator of one Mitchell radio ad. A web ad goes further, depicting two tennis-playing country club stereotypes scheming about their plans to elect Stapleton. “Don’t vote for a Bush insider,” the ad concludes as the players, wearing all white outfits, laugh maniacally. 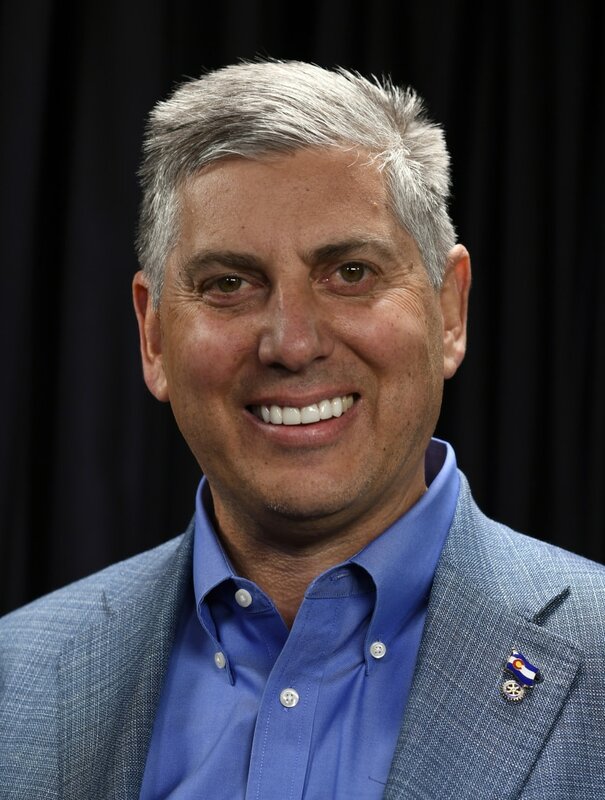 Steve Barlock, who co-chaired Donald Trump’s presidential campaign in Colorado and ran for governor himself before being eliminated at the party convention, said the Bush name is “a huge liability” with Trump voters. Stapleton’s troubles come as the Trump-Bush family feud has heated up recently — Donald Trump Jr. just canceled a fundraiser with George P. Bush, who is running for reelection as Texas land commissioner; President Trump is bragged recently about beating “the Bush Dynasty”; and Laura Bush condemned the Trump administration earlier this week for separating undocumented immigrant families at the border. After Rep. Mark Sanford’s recent defeat in a Republican primary in South Carolina — whom the president opposed — it’s another sign that Trump has become the alpha and omega of today’s GOP. Stapleton’s father, who comes from a different political family, was a co-owner of the Texas Rangers with George W. Bush and later won a plum appointment as Bush’s ambassador to France. But as Stapleton’s GOP rivals attack him in TV ads for “taking big money from the Bush Never-Trump Network,” he’s found himself running from the Bushes and toward Trump — just as his cousin George P. Bush did earlier this year in his GOP primary. George P. Bush was the only Bush to endorse Trump in 2016, and Trump returned the favor earlier this year. But now even that relationship appears to be on the rocks after Jeb, George’s father, slammed Trump’s family family separation policy. Cinamon Watson, a Colorado Republican strategist, doubts the attacks will resonate with GOP voters or stop Stapleton on Tuesday. Still, it’s remarkable that connections to Republican presidents who won Colorado three times (twice for George W. Bush and once for George HW Bush) have become anything but an asset in a GOP primary. Ironically, Mitchell, who has led the anti-Bush crusade, didn’t even vote Trump. And his Bush attacks may be an attempt to shift the focus off that as much as anything else. Meanwhile, a fourth candidate in the race, investment banker Doug Robinson, is a nephew of Mitt Romney. “All the Trump people know none of (the candidates) supported Trump, but now they’re all trying to get the support of the Trump people,” Barlock said. “I also happen to be related to Chris Stapleton, the country music performer who sells out Red Rocks. Just because he’s my second cousin doesn’t mean that I sing like him,” he told the Villager. At the same time, he’s played up his alignment with Trump — and hit Mitchell for not backing the president. Democrats have their own contentious primary on Tuesday, but most analysts expect Rep. Jared Polis will emerge as his party’s nominee to replace term-limited Democratic Gov. John Hickenlooper. Republicans think Polis is too liberal even for an increasingly progressive state, and some think the Bush brand could end up helping Stapleton with moderate voters. Steve House, the former chairman of the Colorado Republican Party, said he’s winced at the personal tone of the attacks on a family that proudly served the country, but can see the political logic. ← Trump: Democrats want immigrants to ‘infest’ U.S.